"Who Am I?/Criminal At Large!" The X-Men team-up with Spider-Woman against Black Tom, Juggernaut and Siryn. Issue #37: Above San Fransisco, Spider-Woman infiltrates the SHIELD helicarrier to get a letter of recommendation from Nick Fury, as she is applying for a private investigator's license. Afte discussing her situation with him, she flies home, unknowingly passing over Black Tom, Juggernaut and Black Tom's niece, a young woman named Theresa, who are planning to rob the San Fransisco Mint of its stock of the United States' vibranium. Meanwhile, in New York, Cerebro alerts the X-Men to the presence of a new mutant, and Professor X assembles a team to make contact with the mutant. 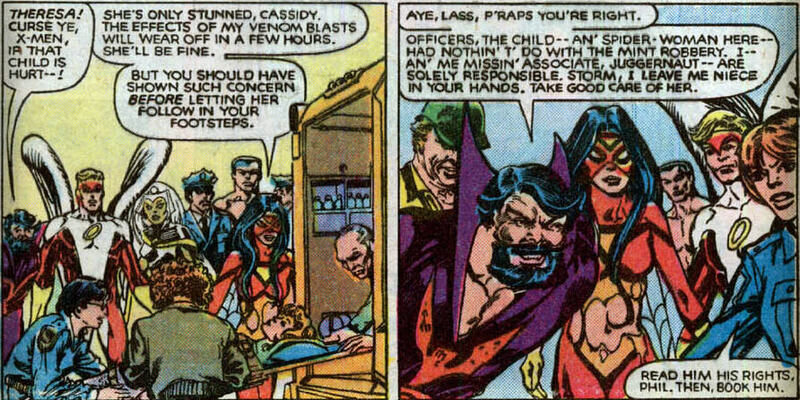 Back in San Fransisco, Spider-Woman arrives home to an impromptu party thrown by her roommate. She changes into her civilian identity of Jessica Drew and hits it off with their landlord before her acute senses detect a crippling sonic scream. Investigating, she trails the scream to the mint, where she stumbles upon the robbery in process. She takes out Black Tom, but Theresa, calling herself Siryn, attacks Spider-Woman with her sonic scream. Spider-Woman defeats her, but is knocked out by Juggernaut, at which point the villains leave with the vibranium. Spider-Woman wakes up surrounded by the police, and is put under arrest for the vibranium heist. Issue #38: Spider-Woman escapes police custody and makes her back to her apartment, where the party is still in full swing. Storm, Angel and Colossus arrive in their civilian identities, and speaking to Spider-Woman privately, explain that Cerebro led them to the mint, which led them to her. 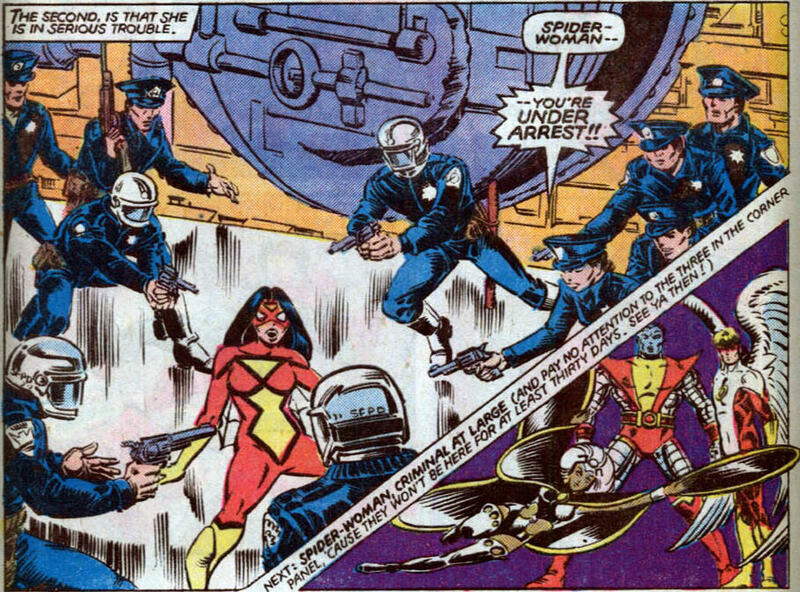 Spider-Woman tells them about Juggernaut, Black Tom and Siryn robbing the mint, and the four heroes leave to search for them. Using a mini Cerebro, they track the villains to a ship in the bay, and attack. Colossus takes out Black Tom and Spider-Woman once again manages to hold her own against Siryn, but Juggernaut easily overpowers first Colossus and then the whole team. Combining her powers with Storm's, Spider-Woman attempts to stun Juggernaut but ends up triggering an explosion that destroys the ship, and in the process, Juggernaut disappears. The X-Men hand Black Tom and Siryn over to the police but Black Tom, wanting a better life for his niece, tells the police that he and Juggernaut acted alone, clearing Spider-Woman and Siryn, whom he leaves in the care of X-Men. A few weeks later, Juggernaut has broken Black Tom out of jail, Spider-Woman receives a letter from the X-Men that Siryn is about to meet her long-lost father, as well as her private investigator's license, and Spider-Woman is ready to start her new life. These two issues are notable for introducing Banshee's daugther, Siryn, who first appears in Spider-Woman #37. She will become a recurring supporting character in X-Men later in Claremont's run before becoming a mainstay of first X-Force and later X-Factor. Though her relationship with Banshee is not revealed in either of these issues (at the end of issue #38, Spider-Woman mentions Siryn being reunited with her long-lost father, and a helpful footnote points us to Uncanny X-Men #148, in which we learn the identity of her father) it is noted that she has similar powers and costume to Banshee, and refers to Black Tom (Banshee's cousin) as her uncle. Siryn is working with the villainous Black Tom and Juggernaut, making their first appearance since hiring Arcade to kill the X-Men at the end of issue #122. The idea here is that Siryn isn't evil, just that Black Tom is using his relationship with the girl (it will later be revealed that he more or less raised her) to get her to commit crimes for him. 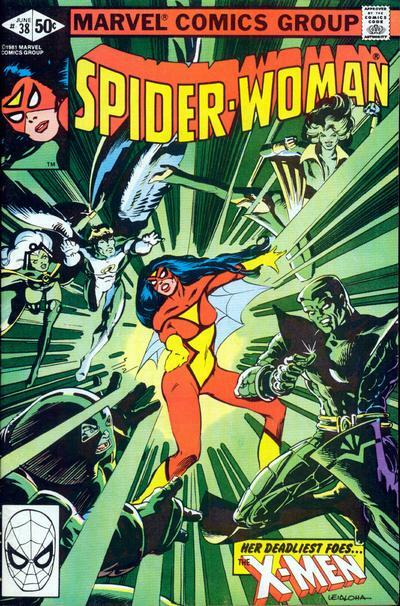 For anyone unfamiliar with Spider-Woman, from the masthead of issue #37: "When Jessica Drew's father injected her with a serum of spider blood, he cured her of a fatal disease... and changed her life completely! Watch her, now, as she confronts her responsibilities, problems and unbelievable POWERS." Her origin has since become much more complicated (and even that blurb is an oversimplification/condensation of her origin; there was a time earlier in her history in which she believed herself to be an actual spider evolved into human form), but the basic gist is that she's a woman with spider powers (enhanced strength, speed, agility and senses, the ability to climb walls and glide, as well as the ability to fire bio-electric "venom blasts"). 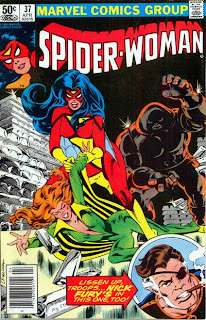 Spider-Woman is an odd character, born of Marvel's desire in 1976 establish a trademark on the name before Filmation could produce a Spider-Woman cartoon (you can read more about that here). She headlined a series during the late 70s and into the 80s that lasted fifty issues before the character faded into the background of the Marvel Universe, making occasional guest appearances (and you can read about the odd end to her series here). In the last ten years or so the character has seen a resurgence in popularity and presence thanks in large part to Brian Michael Bendis featuring her heavily in his Avengers work (she was at one point revealed to have been replaced by the Skrull Queen who kicked off the Secret Invasion event) and she remains a member of the Avengers and in the spotlight today. At this point in her story, these two issues represent a change in Spider-Woman's status quo, as they feature her moving to San Fransisco, meeting a new love interest, and becoming a private investigator. Pencils in these issues are from regular Spider-Woman artist Steve Leialoha, who will go on to pencil a brief three issue run on New Mutants and occasionally fill-in on X-Men. He was more recently the long time inker of DC's Fables, contributing to many of that comic's first hundred issues. 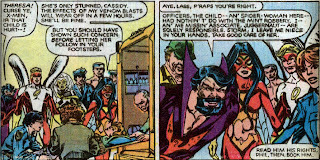 As a point of comparison, the Statement of Ownership for Spider-Woman appears in issue #37. It was selling an average of 126,642 per month (though the series was bi-monthly at this time), with 121,154 nearest to filing date, compared to X-Men's 192,514 per month and 205,736 nearest filing date. When Cerebro first detects Siryn, the X-Men are still cleaning up from the N'Garai demon attack in issue #143, and Storm is seen putting her attic garden back together. Professor X tells the X-Men he has a "contact mission" for them, the first time that term has been used to describe a situation in which the X-Men go out to make first contact with a new mutant. Black Tom, Siryn and Juggernaut steal the United States entire stock of vibranium, a rare metal found in the fictional African country of Wakanda, intending to either ransom it back to the US or to some other country. Black Tom shows himself to be more than a cackling villain at the end of issue #38, as he (somewhat abruptly) tells the police that neither Siryn nor Spider-Woman had anything to do with the vibranium heist, and sends Siryn off with the X-Men, desiring a better life for her. A narrative caption erroneously refers to Juggernaut as a mutant. The main reason we're discussing these issues is because they introduce Siryn, a character who, in addition to representing a significant change to an existing character, eventually becomes an integral part of the X-Men universe. 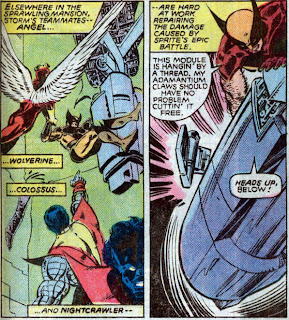 But it also features the first confrontation between the Juggernaut and the X-Men since issue #103 (highlighted specifically by a Colossus/Juggernaut rematch), and serves as a nice introduction to Spider-Woman, a character who, due to Claremont also writing her book, will pop up occasionally alongside the X-Men in the months ahead (and Claremont apparently remained attached to the character, also using her later during his run on Wolverine's solo book). To his credit, Claremont doesn't hand over these two issues to the more popular/better selling characters from his other book, as the X-Men remain firmly guest-stars. The battle with Juggernaut is, admirably, as tense as it should be, considering the only X-Men on hand to fight him are Storm, Angel and Colossus, with Spider-Woman herself offering little to tip the scales in their favor (only the inadvertent explosion of the ship on which they're fighting takes the Juggernaut out of the fight long enough for Black Tom to get handed over to the authorities). Siryn herself receives little development, more or less doing whatever Black Tom tells her to do, but her reluctance to kill her foes foreshadows Tom's change of heart and her eventual departure with the X-Men. So nothing groundbreaking or relevatory, but a fun look at how Claremont handles the X-Men outside their own book, and his tendency to introduce a new character in one book only to later appropriate that character for X-Men. I've never read these two issues, though I intend to someday. I always love discovering "new" old stories about the new X-Men. Also, I like that if you're going to have the X-Men guest-star in another title, the go-to mechanism for doing so is to have them investigating a potential new mutant. Those ROM issues you mentioned last week or so had the same premise! "Steve Leiahola, who will go on to pencil a brief three issue run on New Mutants..."
Isn't his name spelled "Leialoha"? Anyway, I thought he stayed on as inker or something for a few issues past that. I could be wrong, though. Or maybe I'm thinking of Bill S. returning as inker after Leialoha's run? But the real point here is, Larry Hama gave the surname Leialoha to G.I. Joe team member Torpedo. I'm not sure it's ever been confirmed, but Hama had a penchant for naming Joes after his real-life acquaintances, so I assume that was a reference to Steve. "Black Tom shows himself to be more than a cackling villain..."
It really bugs me that he basically became exactly that (a cackling villain) around the time he turned into a tree. As I recall, Claremont used an issue of New Excalibur to have Tom explain that the tree-form had messed with his brain, and when he became human again, he regretted some of his tree-behavior, such as the tree-murder of Juggernaut's little kid pal, Sammy. "Siryn does some whacky stuff with her powers in both issues..."
It sounds like Claremont was trying to make her powers similar to those of Klaw? Maybe the idea is that as the mutant daughter of a mutant, she's even more powerful than her father? "A few weeks later ... Spider-Woman receives a letter from the X-Men that Siryn is about to meet her long-lost father..."
Interesting; I guess this really should be placed before the Doom/Arcade trilogy then. I still find it really weird that the X-Men learned about Siryn and then just sat on the information until Banshee happened to drop by. Professor Xavier (and the rest of the X-Men) are jerks! @Matt: I like that if you're going to have the X-Men guest-star in another title, the go-to mechanism for doing so is to have them investigating a potential new mutant. And one of the interesting things about that (that I realized reading these issues) is how rarely you see that happen in X-Men itself. Aside from the Kitty/Dazzler missions in #129-130, I can't think of the last time the X-Men went out in search of a new mutant in their own title. It almost seems like something Claremont reserves for their guest appearances, because it's, as you say, such a natural way to bring them into another book. sn't his name spelled "Leialoha"? I thought he stayed on as inker or something for a few issues past that. I could be wrong, though. Or maybe I'm thinking of Bill S. returning as inker after Leialoha's run? Could be. Wikipedia isn't terribly clear about which issues they're crediting him as penciller vs. inker. I seem to remember him getting credited on more than three issues though. I'm not sure it's ever been confirmed, but Hama had a penchant for naming Joes after his real-life acquaintances, so I assume that was a reference to Steve. Most likely. In addition to Hama's penchant, Leialoha pencilled a couple issues of GI Joe, so Hama certainly worked with him. (You know, GI Joe would be another series that would be fun to review. But it's not like I need MORE stuff to write about...). I can't remember the exact issue, but I do remember Claremont establishing that explanation as well. I too hated Tree Tom. Slightly Wooden Doesn't Need His Shillelagh to Blast Things Tom was okay, but full on Tree Tom was just weird for the sake of being weird, and become far too cackling and one dimensional. he regretted some of his tree-behavior, such as the tree-murder of Juggernaut's little kid pal, Sammy. Best sentence ever. You know, Chuck Austen's run was abysmal, but I really liked the idea of Juggernaut trying to reform and the work Austen did with him in that regard, including Sammy. Most of the other stuff, not so much, but I did like that. t sounds like Claremont was trying to make her powers similar to those of Klaw? Good point. Though at least with Klaw, you can chalk up some of the non-sound stuff he does to the sonic-dealy on his wrist. I guess this really should be placed before the Doom/Arcade trilogy then. Honestly, there's no really good place for it. #37 was published at the same time as #144 and shows the X-Men cleaning up, like in #144, but then issue #38 (published the same month as #146) ends with a footnote referencing #148 (when Spider-Woman mentions the letter about Siryn being reunited with her father). I stand by my placement of it here, because that's how the Index does it and it fits my "publication order" approach, but it could really go before or after the Doom/Arcade trilogy and fit/not fit just as well either way. Wait. Where the hell did they get this mini-cerebro and why don't they use it all the time?! I mean, they could use it to track down the "lair" of any evil mutant. Be proactive instead of reactive. @Sarah: Wait. Where the hell did they get this mini-cerebro and why don't they use it all the time?! Eh, this isn't the first time they've used a mini Cerebro; it pops up anytime it's plot-convenient. The idea, I think, is that it only works short range. So, like, big Cerebro detects a mutant somewhere in San Fransisco, and the mini Cerebro helps them zoom in once they're in San Fransisco. Could they use it to be more proactive? Yes. Heck, they could use big Cerebro to be more proactive. But that's not how most comic characters act (but we'll see that change a little bit with the X-Men down the road). "Above San Fransisco, Spider-Woman infiltrates the SHIELD helicarrier to get a letter of recommendation from Nick Fury"
Couldn't she have just...set up a meeting or called to have a recommendation mailed to her? I also like how the police simply take Black Tom's word for it that Siryn had nothing to do with the crimes. Top notch investigation work. Also, Black Tom and Juggernaut are caring for Siryn? Is this the first instance of a homosexual couple raising a child in comics? In all of mainstream media!? No wonder these issues took place in San Francisco. @Dr. Bitz: Couldn't she have just...set up a meeting or called to have a recommendation mailed to her? "Infiltrates" might be too strong a word on my part, but at the same time, she surprises Fury in the Helicarrier, so it isn't like she set up a meeting or called ahead. So your point stands. I also like how the police simply take Black Tom's word for it that Siryn had nothing to do with the crimes. Hey, don't look a slam dunk case in the mouth. They just saved themselves tons of work! Is this the first instance of a homosexual couple raising a child in comics? Unfortunately, there's no grand gesture of love on the part of Juggernaut in these issues, making their relationship appear purely professional. @Teebore: Unfortunately, there's no grand gesture of love on the part of Juggernaut in these issues, making their relationship appear purely professional. Well, it's the 80's. You keep things on the DL until you're in the privacy of your own coke den. "Honestly, there's no really good place for it. #37 was published at the same time as #144 and shows the X-Men cleaning up, like in #144, but then issue #38 (published the same month as #146) ends with a footnote referencing #148 (when Spider-Woman mentions the letter about Siryn being reunited with her father). I stand by my placement of it here, because that's how the Index does it and it fits my "publication order" approach, but it could really go before or after the Doom/Arcade trilogy and fit/not fit just as well either way. " I place these two issues just before X-Men 148. The cleaning-up-the-danger-room scene is a non-factor as far as placement (in my opinion). They are still seen cleaning stuff up in Uncanny 149. I don't dig that the "official" placement is before the Doc Doom trilogy. 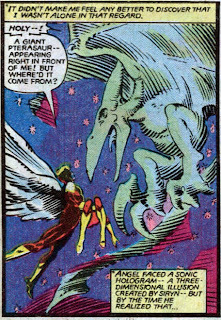 A notable you did not mention here, although I think you mentioned it back when you did your X-Men 28 blog: Roy Thomas originally wanted the "Banshee" character to be female. The term Banshee, of course, traditionally refers to a female mythological figure. At the time, Stan Lee didn't like the idea of a female villain (or something like that) and made Roy change the character to male. 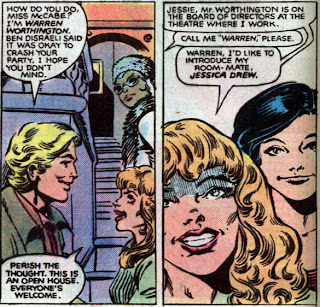 He even hints at part of his plan in UXM 148, that he wanted to create some tension between between Moira and Sean by revealing Sean has a daughter from first marriage. But he seems to have lost interest even quicker than normal. If it hadn't been for Jo Duffy's "Fallen Angel" miniseries, X-Men 148 would have been Siryn's final appearance for the entire 1980s! Jason: I don't dig that the "official" placement is before the Doc Doom trilogy. Fair enough. Ultimately, my placement had more to do with the publication dates of the issues respective to X-Men than anything else. I'm trying to stick (as close as possible) to a "as they were originally released" approach that will be more important (and help keep me sane) once the spinoffs start to roll around. Roy Thomas originally wanted the "Banshee" character to be female. I did mention it back in issue #28, but you're right, it's definitely worth mentioning again here. And years later, I believe, when Banshee, was killed, off, Peter David finally closed the circle by having Theresa change her code-name to Banshee. He did indeed, which I always thought was a nice touch. I've always been curious about that too. I wonder if it just came about as a result of his general flailing about in the wake of Byrne's departure, and then he just lost track of the thread? Didn't she appear as part of the "Muir Island" X-Men prior to #278, during the Reavers/Freedom Force battle in the mid 250s? Or am I completely misremembering that? Either way, your point stands: for a character who's been around since 1981, she is very much a "90s heyday" character. "Didn't she appear as part of the "Muir Island" X-Men prior to #278, during the Reavers/Freedom Force battle in the mid 250s? Or am I completely misremembering that? " She's not in there! Which is weird, right? She should be! Madrox too. Both of them are theoretically on Muir Island at the time, but they don't appear in any of that Claremont Muir Island stuff circa the 250s. 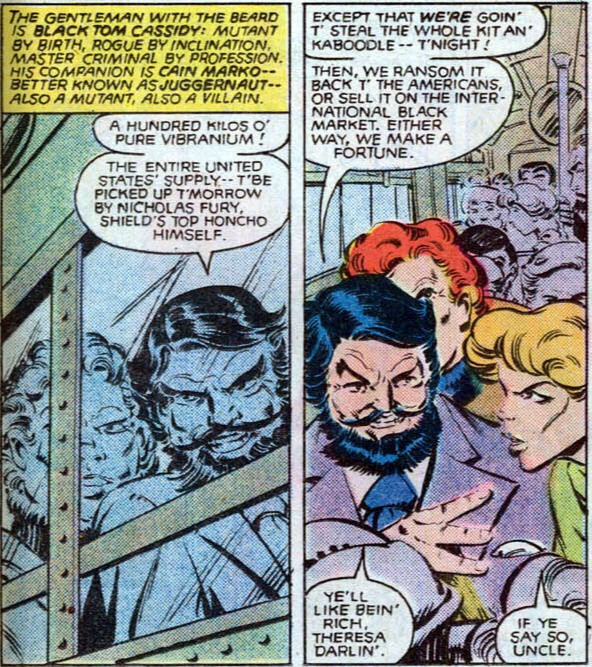 Then all of a sudden Siryn and Madrox are part of the Muir Island group in X-Men 278. @Jason: Both of them are theoretically on Muir Island at the time, but they don't appear in any of that Claremont Muir Island stuff circa the 250s. Madrox and Siryn are there for the "Kings of Pain" crossover in the 1989 X-annuals. Ha, I forgot they were still cleaning up in issue #148! Now I'm starting to think Claremont was messing with Jim Shooter by taking his "repair the headquarters" philosophy extra seriously. I don't know a lot about professional writing, and I assume evryone does it differently anyway, but I kind of wonder if Claremont kept any notes detailing the status quos of the various characters he had relegated to the sidelines. Because sometimes it really, really seems like he just tried to keep it all in his head, which was not a good move. Maybe I'm too clinical about it, but with such a large cast of extras and secondary characters, I would probably keep some sort of spreadsheet (or whatever the primitive 80's equivalent was) detailing exactly where everyone was and possibly even what they were doing when they weren't on the page. @Matt: Now I'm starting to think Claremont was messing with Jim Shooter by taking his "repair the headquarters" philosophy extra seriously. Ha! That would be hilarious, if true. Because sometimes it really, really seems like he just tried to keep it all in his head, which was not a good move. I have to go through my notes and double check, but I think there's a quote from Weezie where she either directly states or more or less implies that Claremont did not keep track of that stuff outside his head, which is why she took it upon herself to do it more formally and occasionally remind him of stuff he still had simmering. At the very least, I've always gotten the impression that Claremont did just try to keep it all in his head; whether there's any definitive statement to that effect, I don't know. I would probably keep some sort of spreadsheet ... detailing exactly where everyone was and possibly even what they were doing when they weren't on the page. Ditto. Heck, I do keep track of stuff like that when writing fiction, and none of it is anywhere near as complex, in terms of number of characters and ongoing subplots and whatnot, as what Claremont did. I've never read these issues. 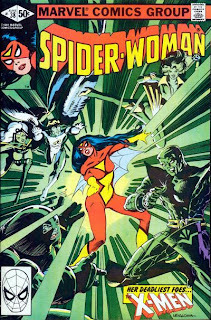 My first exposure to Spider-Woman was in a Marvel Two-in-One that must've come soon after her intro in Spotlight because she still had the old mask. I read (and enjoyed) the 1979 Pocket Books reprint but didn't pick up many issues of the series. I remember the short-lived 1979 DePatie-Freleng / Marvel cartoon too — as well as Filmation's competing Web Woman in Tarzan and the Super 7. Anything superhero was awesome at that age and in those days. Dr. Bitz took like half my comments, by the way, but I'd already written up a few, so pardon the duplication. [Siryn's] relationship with Banshee is not revealed in either of these issues ... [I]t is noted that she has similar powers and costume to Banshee, and refers to Black Tom (Banshee's cousin) as her uncle. Which means that unless you think 1 + 1 = 875, you got it. By the way, I usually refrain from going all editor on blogposts to be politic, but I think that "relationship to Banshee" is more proper — "relationship with Banshee" sounds kinda Mother, May I Sleep with Danger? And By Danger, I Mean Daddy. One more issue of this and we'll have reached "Due to injuries suffered in X-Men #119" proportions. And they just accept it! I can see the scene back at the precinct now: "Weren't there a couple of costumed women also involved?" "Uh, well, yes sir, based on reports anyway, but the fella said they had nothing to do with it, and the academy teaches us to always take the word of a superpowered criminal." Yeah. I get the feeling that at some point in the '70s everything started to work like Green Lantern's ring. At DC, Starman's cosmic rod began making constructs and in a JLA/JSA crossover with the Fawcett characters so did Ibis the Invincible's Ibistick. He's not a mutant? I was under the impression that the gem of Cyttorak merely augmented his inherent abilities. Matt: It really bugs me that he basically became exactly that (a cackling villain) around the time he turned into a tree. As I recall, Claremont used an issue of New Excalibur to have Tom explain that the tree-form had messed with his brain, and when he became human again, he regretted some of his tree-behavior, such as the tree-murder of Juggernaut's little kid pal, Sammy. Now I know how non-comic-book people feel when they hear matter-of-fact ridiculous comic-book stories. "Oh, man! Did you see what happened when Teresa forgot her lunch? Her uncle came crashing through the wall of the school with her sandwich!" "She's weird. And where's her dad, anyway?" "I hear he's one of the Hardy Boys." Jason: The term Banshee, of course, traditionally refers to a female mythological figure. While that's true, Marvel also has one group of characters with both a Medusa and a Gorgon — and Gorgon is a dude. In The Tempest, Ariel is a nominally male spirit, although he takes human form. Plus, of course, everyone knows that Havok is a girl's name. I do remember hearing that Stan Lee thought it was weird that Banshee was a man when Roy was pointing out the characters to him, however. The fact that he didn't remember the earlier conversation about not wanting a female villain wouldn't be a surprise — I have a lot of respect for Stan, mostly despite his outsize hucksterism, but Stan's memory has proven to be iffy at times. 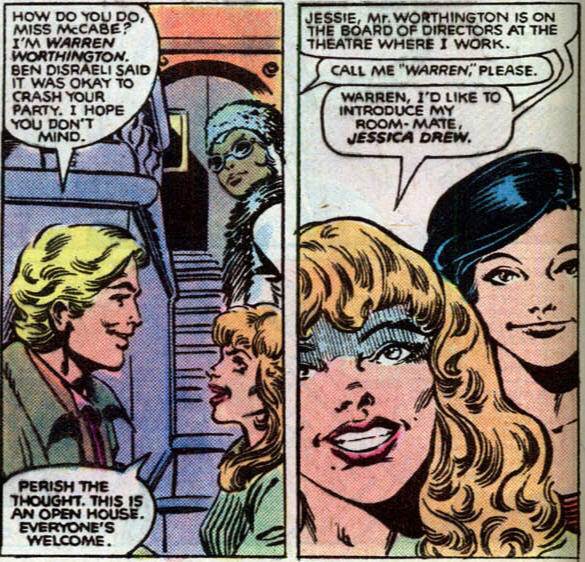 [Claremont] wanted to create some tension between between Moira and Sean by revealing Sean has a daughter from first marriage. Which is weird, since Moira also had a child, was still technically married like 20 issues prior, and — not so relevant to her relationship with Sean but not for nothing, either — said child went on a murderous rampage. Matt: I kind of wonder if Claremont kept any notes detailing the status quos of the various characters he had relegated to the sidelines. Because sometimes it really, really seems like he just tried to keep it all in his head, which was not a good move. Strangely enough, I've heard a lot of stories about the penciler keeping stuff straight for the writer during this period. Byrne to some extent with Claremont and definitely George Pérez with Marv Wolfman — almost famously, in the case of Crisis; it's why George stepped up to co-plot halfway through even though after contributing so much to Titans all he wanted to do was draw it and enjoy the plots as they came in. You might figure that the artist would be the one who didn't keep track of stuff as they were going along, which plotter/pencilers from Jack Kirby to Rob Liefeld have indeed been known to (not) do — heck Galactus's outfit could change from panel to panel — so what the deal was with the likes of Claremont and Wolfman I have no idea. @Blam: "relationship with Banshee" sounds kinda Mother, May I Sleep with Danger? And By Danger, I Mean Daddy. Ha! I think you're right. Yeah, I really am starting to wonder if, like Matt suggested at one point, Claremont was intentionally trying to stick it to Shooter and his "depict the ramifications of a fight" edict. "Uh, well, yes sir, based on reports anyway, but the fella said they had nothing to do with it, and the academy teaches us to always take the word of a superpowered criminal." I get the feeling that at some point in the '70s everything started to work like Green Lantern's ring. Well said. That does indeed seem to be the case. As far as I've always understood it (and it's certainly possible this has been edited/retconned without my knowledge), he's an ordinary guy whose powers come entirely from the gem, such that he is depowered on the occasions that he "loses" the gem or Cyttorak transfers the power to someone else. I can't deny that sometimes I enjoy laying all this stuff out matter-of-factly just for giggles. Being able to say "Cable is the son of Cyclops and Madelyne Pryor, a clone of Cyclop's occasionally dead childhood sweetheart, who was infected with a techno-organic virus and sent into the future to be partially cured and was raised, in part, by the consciousnesses of his father and his mother's template in different bodies before he grew to adulthood and returned to the time shortly after his birth now an adult much older than his father in order to lead the junior team of heroes his father led in preparation for a final battle with the villain who infected him and forced him to be sent into the future in the first place, most of which was the plan all along of another villain who cloned his mother in an attempt to bring about his birth in the first place" is one of those great, only-in-comics things. Yeah, he died as part of Ed Brubaker's Deadly Genesis miniseries in 2005 (the 30 year anniversary of Giant Size), the series which established the whole "there was a team of X-Men sent to Krakoa before Storm, Wolverine, etc., who died, one of whom was the third Summers brother, who is alive after all" retcon. 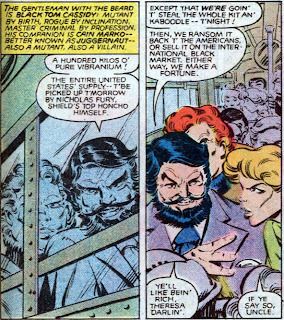 Banshee died in the second issue saving a commercial airplane, but since his death came at the beginning of a series clearly meant to monkey with Giant Size and following a period of time in which Banshee was largely unused, it was, unfortunately, not as impactful as it should have been. And, as you suggested, it has, thus far, stuck (aside from his temporary resurrection as a techno-organic zombie alongside tons of other similarly dead-and-zombified characters in the "Necrosha X" storyline a couple years back). Good point. Tension was certainly there to be had already. ...so what the deal was with the likes of Claremont and Wolfman I have no idea. And Stan at least had the excuse of having to, more or less, keep the details on the entire Marvel Universe straight while writing the vast majority of the books, whereas later writers like Claremont, Wolfman, etc. had only a few books at a time to manage, with their own editors to boot. Yeah, I had to restrain myself too. What's there to say about a long mystic wand of power that vibrates in the presence of evil anyway? I really appreciate you coming back for replies, by the way. @Blam: What's there to say about a long mystic wand of power that vibrates in the presence of evil anyway?I really appreciate you coming back for replies, by the way. My pleasure. Seriously. Half (if not more of) the fun of these posts is the discussion (which is what makes Blogger's recent changes all the more frustrating, since they directly make that harder to do).